Hello friends ess article me hum Samsung Galaxy Note 9 ke baare me discuss karenge.company ne samsung galaxy note 9 india me launch kar diya hai. Samsung company ne note 9 ko india me wednesday ko launch kiya hai.jaisa ki aap sab jante hain samsung apne mobile phone me alag-alag new updates laati rehti hai.or vahin dusri or india me Redmi ne Samsung ko nye-nye challenges diye hain.unhi challenges ko compete karte hue apne brand me new inovation karti rehti hai.vaise bhi samsung company ke mobile phone bahut hi good quality ke hote hain.jo apne time se bhi jayada run karte hain,esliye hi samsung par market ka trust hai. Galaxy unpacked event me company ne latest Galaxy Note 9 ko launch karne ke saath hi s pen ko bhi launch kiya hai. jiski market me bahut dino se charcha ho rahi thi.samsung galaxy note 9 2017 me launch hue Galaxy Note 8 ka upgrade version hai.ess mobile phone ki main baat hai ke aapko esme 1 TB tak ki storage milegi.or esi ke saath Exynos 9810 processors milega.or USA America or others market me ye mobile phone Qualcomm Snapdragon 845 Processor or 8 GB RAM ke saath milega.or next time aapko kuchh or new updates bhi dekhne ko mill sakte hain. Note 9 me bahut achhe specification diye gaye hain or new improvements bhi kiye gaye hain note 9 ki Battery bhi upgrade ki gayi hai jsime aapko battery back up bahut achha milta hai.or camera aperture bhi badhaya gya hai.ess mobile phone ki display bhi achhi coated hai. ANDROID - 8.1 Oreo ke colour OS 5.1 par run karta hai. Ram - 6 GB / 8 GB. DISPLAY - 6.4 - Inch ki super Amoled Screen 1440 x 2960 Pixel hai. BATTERY - 4000 MAH ki di gayi hi. Camera - 12 mp + 12 mp Dual Rear setup dual aperture f 1.5 - f 2.4 diya gaya hai. Screen - Corning Gorilla Glass 5 coated diya gya hai. 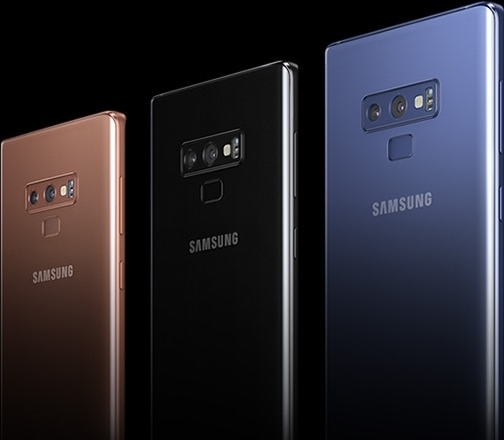 Samsung ab note mobile phone ko bluetooth low energy (BLE) support ke saath use karne ka new idea lekar present hua hai.aap sirf ek click ke saath ab selfie le sakte hain.group photo le sakte hain slides run kar sakte hain.video ko play or pause karna bhi possible hai.kyonki s-pen ek remote ki tarah work karta hai.jis se aap ye sab work bahut hi aasani se kar sakte hain.or mobile phone ko easily control kar sakte hain.or aane wale kuchh time me developers s pen ke new advanced BLE function ko apps ke saath integrate kar sakte hain. vahin aap s-pen ki help se aasani se picture click kar payenge.samsung ne bataya hai ke aap agar s-pen ko 40 seconds charge karte hain to aap s pen ko 30 minutes tak use kar payenge.or esi ke saath smartphone me lagane se s-pen apne aap automatic charge hota rehega. 512 GB varient 84,900 Rupay me Buy kiya ja sakta hai. 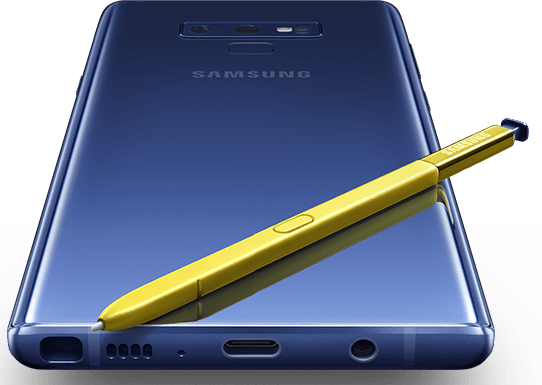 Galaxy Note 9 midnight black or metallic copper color me matching s-pen ke saath market me or online available hoga.or ocean blue color varient yellow color ke s -pen ke saath available hoga.